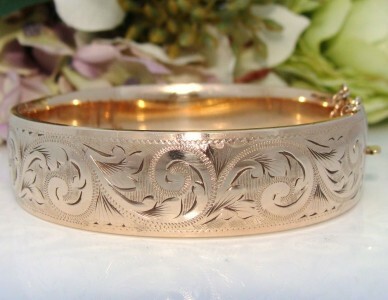 What a Beautiful Bangle Bracelet of solid, quality English construction! With a warm yellow gold hue, this pretty bangle bracelet features a stylized floral & foliate design set within the plain bands, reaching to clasp and hinge. The delicate diamond cut detailing really makes the design stand out and catches the light at every turn. The back and the interior are plain and smooth. The hinge opens & closes smoothly and the clasp clicks shut securely. There is absolutely no way this one will fall off! The original safety chain is in situ for added security. This has a metal core; bracelets with a metal core are constructed with a shell of 9 carat gold (usually up to 4 times the thickness of standard rolled gold/Gold Filled) bonded to a jeweller’s alloy or metal core. Bangles with a metal core wear so much better than bangles of solid gold as the metal core provides solidity and strength to the construction. They were known to come with a warranty of 20 years and longer against tarnishing and wear, their quality is Outstanding. It has the silky smooth feel associated with solid carat gold and expected of quality antique jewellery. It has a warm, yellow hue and is so much nicer than the pictures suggest. Near MINT Vintage condition! There are no dents, damage, wear or repairs to mention, and minimal light scratching to the back consistent with a minimum of previous use. The finish is Pristine with that warm buttery hue and that Quality unmistakable silky feel of solid carat gold. You will be thrilled with this purchase – what a beauty!